Moira Shearer as the ballerina who must dance. Cannes, May 2009 and Martin Scorsese gives an emotional introduction to a screening of the film that inspired him as a young filmmaker, The Red Shoes from Michael Powell and Emeric Pressburger, in a new print following restoration initiated by Scorsese himself. Following the recent demise of the great British cinematographer Jack Cardiff for whom The Red Shoes was a triumph, it seems a perfect moment to post a set of notes on the film I wrote back in 2001. Warning: This is a long post, but worthwhile, I hope, if you love the movie or want to study it in detail. It also assumes that you have seen the film. The Red Shoes eventually became a commercial success despite the lack of belief shown by its UK distributors. Indeed, it was for many years the most successful British film at the American box office and throughout the 1950s and 1960s became a favourite film of thousands of young girls who dreamed of the ballet. The film was perhaps the high point of the careers of both of its joint creators, Michael Powell and Emeric Pressburger. Its success was hard to match in box office terms and led them towards future opera films which were even more ambitious and decidedly less commercial. The status of Powell and Pressburger has changed dramatically over the last thirty years. From the late 1940s through to the 1970s the duo suffered because their notion of a cinema that was anti-realist and romantic/passionate clashed with the prevailing critical opinion that favoured directors such as Carol Reed and David Lean. The re-discovery of Powell and Pressburger was led in the UK by a group of film historians and theorists, but it was helped by the support offered by American fans, who included Francis Ford Coppola and, most importantly, Martin Scorsese. The National Film Archive restored several classic Powell and Pressburger films, including The Red Shoes and they have since become central to the revised conception of what constitutes British Cinema. Michael Powell and Emeric Pressburger met for the first time in 1938 under the auspices of Pressburger’s compatriot, the producer Alexander Korda. Powell had just become established as a major director after an early career as an assistant in silent cinema and as a director of short features, including ‘quota quickies’ made by American studios in Britain. He was a highly experienced and cineliterate 33 year-old. Pressburger was a Central European Jew escaping from the Nazis having developed a career as a scriptwriter in Germany and France. The two were put together by Korda to work on The Spy In Black. After the success of this film they worked together for the next eighteen years. In 1943 they formed their own production company The Archers, building up a team of cinematographers, designers and music composers as well as a stock company of actors. The Archers worked as one of a group of independent producers under the umbrella of the Rank Organisation at Pinewood studios. The Life and Death of Colonel Blimp (1943) was the seventh Powell and Pressburger collaboration and the first film of The Archers. It was followed by another four major films – A Canterbury Tale (1944), I Know Where I’m Going (1945), A Matter of Life and Death (1946) and Black Narcissus (1947) – an unprecedented history of commercial and artistic achievement (even if not appreciated by many of the critics at the time). The Red Shoes was made by a team at the height of its powers and a company able to command a relatively large budget and the best facilities at a time of general austerity. In the mid 1940s, the Rank Organisation consolidated its position as the major player in the British film industry, acquiring two of the three main cinema exhibition chains, the biggest distributor and the two largest studio facilities at Denham and Pinewood. The previous Archers films all opened in Leicester Square and A Matter of Life and Death became the first Royal Film Command Performance in 1946. But perhaps more important than all these advantages was the prestige that The Archers had earned through their use of Technicolor. The full Technicolor process became available in the late 1930s and was a major feature in the success of Gone With the Wind in 1939. It was a relatively expensive process and few British films were able to use it (only six in 1948). Further problems were the close control that Technicolor’s own consultants exercised over filmmakers and the unwieldy ‘monster’ camera. The Red Shoes set for the Covent Garden sequence. The Archers had used Technicolor successfully on Colonel Blimp, memorably on Life and Death with heaven rendered in monochrome Technicolor rather than black and white and on Black Narcissus – arguably the most beautiful British film ever made. It is no exaggeration to suggest that in 1947, The Archers knew more about using Technicolor in adventurous ways than any studio in Hollywood. Indeed when Jack Cardiff thought that the studio lights at Pinewood were not strong enough to illuminate the colour sets on The Red Shoes, the American suppliers sent over prototypes of new models, such was Cardiff’s reputation. The Archers present a fascinating case study in terms of the ‘messages and values’ of Britain in the 1940s. In a commercial sense they clearly made a number of films that drew large audiences and 49th Parallel, Blimp and Life and Death were box office winners. At the same time, they made films that surprised and contradicted some of the edicts of the wartime government and in 1948, The Archers were clearly out of step with the leading film reviewers and critics. The degree of autonomy that The Archers achieved as independent producers means that it is legitimate to consider the company almost as an ‘authorial entity’. Powell and Pressburger worked together taking joint credits, ‘Written, Produced and Directed by . . . ’ and the whole creative team was involved in the production. It is important, therefore to establish the values and ideas of the team. Michael Powell was an ‘English gentleman’ – a ‘Man of Kent’, the son of a middle class farmer. Although essentially English, he was not a ‘little Englander’ and benefited greatly from his early career abroad and his travels overseas. Emeric Pressburger, like many other European émigrés to England in the 1930s, became ‘more English than the English’ in some of his attitudes, but still retained his Central European cultural roots. The creative team included the Germans, Alfred Junge and Hein Heckroth. During the 1930s, the impoverished British film industry was enriched by a constant stream of European refugees, many of whom had worked in the German theatre and film industries of the 1920s and 1930s. These highly skilled and professional craftsmen were engaged to train British technicians. Led by the two strong personalities of Powell and Pressburger, The Archers became associated with certain types of films with very distinct qualities. Powell and Pressburger were passionate and romantic, individualist and internationalist. Their films burst with vitality and exuberance, both in the actions of the characters and in the aesthetics they employ (i.e. cinematography, set design, music etc.). This placed The Archers in opposition to the prevailing aesthetic of ‘realism’ which characterised wartime fictions and documentaries (see ‘The Critics’ below). It is true that popular British films also included the sensational melodramas produced by Gainsborough Studios, but The Archers films were targeted at more middle class audiences and carried much higher production values. A typical Archers theme was the triumph of ‘passion’ over ‘practicality’ so in I Know Where I’m Going (1945), Wendy Hiller plays a banker’s daughter who travels to the Hebrides to marry a rich industrialist. He has bought an island in this remote region, but his wealth is no match for the ‘spiritual’ wealth of the local laird and the heroine falls in love with the laird. In A Matter of Life and Death, a young airman is allowed to live because he has fallen in love with the American radio operator trying to guide home his ailing bomber – passion triumphs over death itself. This belief in passion over practicality meant that The Archers were to some extent out of step with the dominant ideology of austerity Britain, in which the new idea of the Welfare State (Education, the National Health Service, National Insurance) emphasised working together to achieve minimum living standards for everyone. Indeed, The Archers’ Black Narcissus, in which a group of Anglican nuns attempt to take education and healthcare to an Indian princely state in the Himalayas, could be seen as a comment on the principles of the Welfare State. The nuns fail, primarily because they cannot respond to the spirituality of the alien environment – they must repress their passion. Powell and Pressburger were essentially ‘High Tories’ (i.e. ‘cavalier’ and rather arrogant in the way of the landed gentry in the pre-industrial age), but their ideas were complex. In The Life and Death of Colonel Blimp, they made one of the three central characters an old soldier like the Colonel Blimp invented by the left wing cartoonist David Low. They showed him to be anachronistic – out of touch with modern warfare – but they also showed him to be a man with a romantic past, a man who could love and be loved. More controversially, they explored his past friendship with a German officer (played by Anton Walbrook) and in one famous scene this character, as a refugee in London in 1939, gave a speech both praising and criticising Britain. This ‘evenhandeness’ did not go down well with the War Office and futile attempts were made to ban the film (see Ellis in Christie 1978). This wasn’t the first time that Powell and Pressburger had created believable and rounded German characters. On their first film together, The Spy in Black (1939), the central character was a U-boat captain in the First World War. Their highly successful propaganda picture 49th Parallel (1941) followed the adventures of a U-boat crew fleeing across Canada in order to get to the (then neutral) United States. Because of their prestige, The Archers were always asked to support the war effort in their choice of subjects, but both A Canterbury Tale (1944) and A Matter of Life and Death (1946) presented very complex stories about the relationship between Britain and America as allies. None of The Archers films could be said to be a simple reflection of prevailing ideas. Their films were always personal in conception – often with the ‘English’ view coming from Pressburger and the ‘international’ perspective from Powell (although it is difficult to separate the two contributions). The third aspect of The Archers work, which surfaces directly in The Red Shoes for the first time, is their interest in what might be termed the ‘art film’. This does not mean the ‘arthouse film’ as understood since the 1950s, but more the film associated directly with ‘high culture’. Such films were occasionally produced by the major studios and included biopics of classical composers as well as adaptations of opera and ballet. The Archers wanted to make a film about art and artist(e)s and Powell in particular wanted to make a film “as if it were an opera” – a ‘composed’ film, with the visuals constructed to fit the music. Black Narcissus, although not associated with ‘art’ was Powell’s first attempt at the composed film with a score that included original music and sound effects closely integrated with spectacular visual effects. The culmination of this dream was the 1951 opera film, The Tales of Hoffman. (This idea of Powell’s eventually resurfaced as the basic production procedure for music videos in the 1980s and also directly inspired Martin Scorsese’s collaboration with Bernard Herrman over the score for Taxi Driver (1976)). One of Hein Heckroth’s sketches for The Red Shoes ballet. The conception of a colourful and spectacular film about ballet in the context of the austerity in Britain of the late 1940s raises interesting questions about ‘messages and values’. The Rank Organisation and their American partners were unsure about bankrolling the film, but The Archers were convinced that in those dreary days, crowds would flock to see something glamorous and uplifting. Geoffrey Macnab (1993) suggests that Rank’s policy of ‘quality’ and ‘prestige’ pictures was not popular with mass audiences who resented films that were deemed ‘educational’. Macnab quotes a letter from Picturegoer magazine in May 1947 complaining of “films made for a small group of long-hairs”. Powell himself in part two of his autobiography states that in America, “the film was classified as a British art movie and opened to brief notices to be read only by balletomanes, which meant about half the little girls in America”. In one small New York cinema the film went on to run non-stop for over two years. (The film was not given a wide release in America until 1951.) Across the world it became a ‘must see’ film for ballet fans. In the late 1940s there was far less competition for the patronage of arts lovers (i.e. no television) and Powell’s instincts were proved correct – except perhaps at home in Britain. It is difficult to discern the true box office returns for The Red Shoes in the UK because the film did not receive a proper release from a reluctant Rank Organisation. Powell suggests that returns were ‘only average’, but see the reference to the box office chart in the Audience section below. Certainly, the film survived in the British memory as a classic. The specific values associated with the film are only evident through a close reading. The Red Shoes is a film about ‘passion’ and ‘art’. It is a film about ballet and it includes an uninterrupted 17 minute ballet sequence. But it is primarily a melodrama in the true sense of a ‘drama with music’. It’s a romantic melodrama, but one in which sexual love is displaced by a love of art. Doty (2000) also suggests that it is a ‘queer’ film in which the love of art is transgressive because it is encouraged by the central gay character of Lermontov. The key to the theme of the film is the early exchange between Vicky and Lermontov when he says: “Why do you want to dance?” She replies: “Why do you want to live?” Lermontov then replies: “I don’t really know – only that I must”. Later, after her success in ‘The Red Shoes’ he asks her again what she wants out of life – to live . . . ? She cuts in: “to dance”. Vicky chooses dancing over life and makes the ultimate sacrifice at the end of the story when like the heroine of Hans Andersen’s story, the shoes carry her to her fate. (In the original story the girl asks for her feet to be chopped off with an axe. She then survives with wooden feet and repents her sins. The tale is about the little girl’s vanity in wanting red shoes that lead her away from worship at her church). This is a film which explores the old saw about art imitating life. The triangular relationship between the composer, the impresario and the dancer is mirrored in the real relationships which surrounded the making of the film. The Lermontov-Vicky relationship has been seen by some ballet followers as a reference to the power of the great impresario Diaghilev over the dancer Nijinsky. Played by Anton Walbrook, one of The Archers favourite actors, Lermontov was cited by the filmmakers as being based upon Alexander Korda. It was Korda who brought Powell and Pressburger together and to whom the script was first offered by Pressburger in 1937. Yet the reputation of Michael Powell vis-a-vis his leading ladies also suggests the power exerted by Lermontov over Vicky. The parallel between the film’s production and its story go further. Powell and Pressburger were as committed to their art and to cinema as Lermontov was to ballet – “like a religion”. Moira Shearer, like Robert Helpmann and Leonide Massine, was a leading ballet performer and rising star of the Sadlers Wells Ballet, challenging Margot Fonteyn for leading roles. She was initially reluctant to take on the film role. Powell claims he tricked her into accepting by pretending to take on an unknown American in order to make her jealous. The film was extremely hard work since the ballet was shot on the concrete floors of Pinewood stages rather than the sprung boards of a ballet school. Shearer risked serious injury and also developed an abscess which required surgery, delaying the shoot. Nevertheless she went on to dance in another Archers film, The Tales of Hoffman and to give up her career at the age of only 27 to become an actress. Her later career was not particularly successful, but by appearing in The Red Shoes she became probably the best known ballet dancer in the world during the second half of the twentieth century. The war is never mentioned in The Red Shoes, which could be set at any time in the first half of the twentieth century or even the end of the nineteenth. What is intriguing is the company of men that becomes dependent on the magic of the single woman dancer. There are no significant other female roles in the film and the possibility that what is being presented is a struggle for Vicky’s talent/art as conducted by the gay company headed by Lermontov and the heterosexual world of convention represented by Craster. This is the reading offered by Alexander Doty and it is a reading very well supported by the evidence. Doty presents plenty of evidence to suggest some form of (repressed) queer sensibility in Powell and Pressburger’s working relationship. He points to the gay actor Anton Walbrook playing the gay Lermontov and to Andersen’s gay status and the creation of the shoemaker in the story as gay. He offers the evidence of specific scenes such as the one in which Vicky is summoned to Lermontov’s villa in Monte Carlo soon after they have arrived. She expects a dinner date and arrives suitably dressed, but Lermontov is with his male colleagues and he is dressed casually with sandals, open shirt and cravat. He desires to use her talent to dance rather than to pursue her sexually. Significantly, the ‘straight’ Craster is kept outside the circle of men, only invited in when Vicky has accepted the role. In the final confrontation in Vicky’s dressing room, Craster appears to believe that Lermontov is his rival in love, but Lermontov dismisses this by saying that it is something he, Craster, cannot understand. This refers both to Lermontov’s desire to create Vicky as a Diva, but also to his repressed homosexual desire. The Red Shoes is a melodrama, using the term in its modern guise to mean a film that is essentially about feelings and relationships (it was once a very general label, applied to Hollywood action films). Central to the modern conception is the notion that whatever is unspoken or ‘repressed’ in a relationship will ‘erupt’ as a form of cinematic excess. Thus melodramas use colour, music and design to over emphasise. A good example of this is the appearance of Craster and Lermontov at the end of the film. Both are dressed excessively – Lermontov in his formal dress and Craster in a leather coat so glaringly out of place in the sunshine of Monte Carlo (it also makes him look like a Gestapo officer). Both have longish hair brushed back and held by grease or gel. When they get excited during the confrontation their hair becomes wild and disturbed – a sign of their inner turmoil. As Lermontov announces Vicky’s non-appearance, he is tremendously repressed, barely able to speak and completely unable to say that she is dead, only that she will never perform the role again. What is unspoken is Lermontov’s sublimation of his sexual desire to an obsession to create Vicky as a star dancer. It is this desire that fuels the narrative and which erupts in the mise en scène at various points, such as his fondling of the phallic sculpture of a severed foot and ballet slipper during his description of ‘The Red Shoes’ ballet for Craster and his anguished self mutilation, pushing his fist into the mirror after Vicky has gone off with Craster. Everything about the film is a hymn to excess – made even more intense by the film’s appearance at a time of austerity. Vicky’s costumes are worth consideration, being specially designed by Jacques Fath of Paris, an important contemporary of Dior and Balmain. 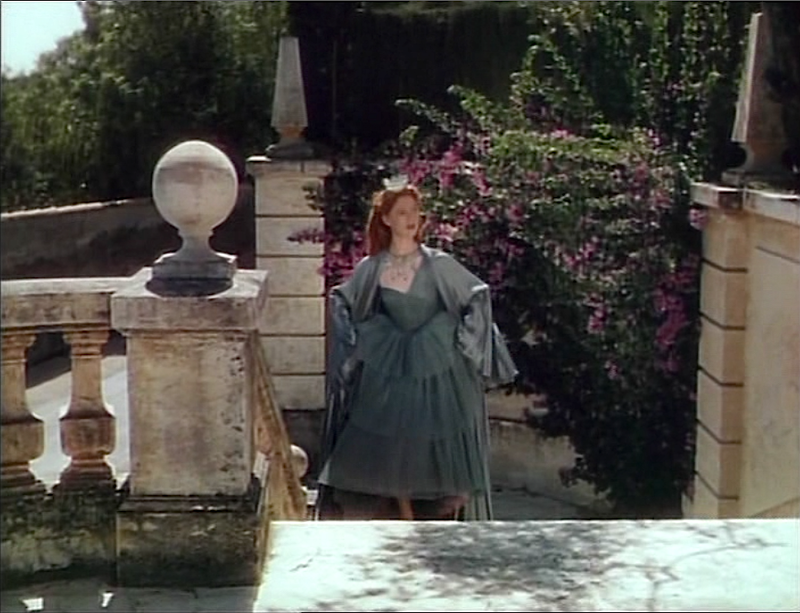 There is a website devoted to Fath’s designs for the film that features the dress worn by Moira Shearer when Vicky goes to Lermontov’s villa. She even wears a small crown in this scene – a nod towards the fairy tale princess of Hans Andersen tales? This dress is matched by the green suit and outrageous wide-brimmed hat that she wears when Lermontov (wearing striking dark glasses) intercepts her on the train at Cannes on her return to the Riviera. The reappraisal of Powell and Pressburger’s work coincided with the development of feminist writing on film. Some of Powell and Pressburger’s work interested feminists because of its adoption of melodrama narratives (e.g. Black Narcissus and Gone to Earth (1950) in particular). The Red Shoes appears at first sight to be a film in which the life of a young woman is ‘taken’ by an uncaring impresario. She appears to be an ‘object’ of beauty and talent, torn between two men and unable, or not allowed, to have a life of her own. In these terms the film is firmly within the concept of patriarchy, a world ruled by men and in which women have little power. It could be argued that in terms of the return to ‘normality’ after the ‘liberation’ of women during the 1939-45 war, The Red Shoes conforms to the same regressive ideology found in American films noirs of the period when women with beauty, vitality and strength of character are eventually punished for trying to claim passion and sexual fulfilment as well. The ballet itself shows the girl being ‘led astray’ by the shoes, dancing with ‘rough men’ and ‘loose women’ and eventually to her death. The Red Shoes was not a new venture for The Archers. Similar strong and beautiful women are the focus of attention in both the two preceding films, Wendy Hiller in I Know Where I’m Going and Deborah Kerr in Black Narcissus. Against this view it can be argued that for the audience of young women interested in ballet, Vicky was a passionate and romantic heroine who they overwhelmingly chose as a point of identification. Doty’s analysis also suggests that the relationship between Powell and Shearer was not always what it might have seemed. Moira Shearer may have ‘suffered for her art’ at the hands of a dictatorial director, but there is also evidence to suggest that Powell was in awe of Shearer, that her beauty and her talent cast a spell over him rather than vice versa – i.e. that she was the Lermontov figure. Doty argues that although Powell was ‘in charge’, he knew he was dependent on Shearer as the dancer, just as Vicky was dependent on Lermontov. It is very difficult to collect any empirical evidence about British audience reaction to The Red Shoes on its initial release, even if we can state with some conviction that since its release it has gained acceptance as the most famous ballet film and has presumably developed enough commercial appeal to justify its restoration and re-issue by the National Film Archive and BFI Distribution as well as various video and now DVD releases. References to the film in Film Review for 1948 and 1949 are surprisingly low-key, especially since the previous Archers film, Black Narcissus won two Oscars (for colour cinematography and set design) in 1948. The Red Shoes is not featured in the round-up of major films released in 1948 but in 1949 it is reported that the film was Number 10 at the 1948 British box office (such listings were not as reliable in the 1940s as they are now) and that again the Archers won two Oscars (for set design and musical score). It is worth considering the kind of coverage that a production company registering this kind of Oscar success would merit in 2001. (But note, too that the best picture Oscar for 1948 went to Laurence Olivier’s Hamlet, Olivier himself won best actor and the film also won best design (black and white)). We can, with more confidence, comment on the critical response to the film in 1948 and discuss the broader context of British film criticism at this time. Macnab (1993) makes reference to the critics in his analysis of Rank’s distribution strategy. He points out that at the time of The Red Shoes production in 1947, at the highest point of British cinema attendance, there were splits in the audience and critical opinion about the worth of British cinema. ‘Popular’ audiences, which in the 1930s had largely preferred Hollywood films had in the early 1940s come to appreciate British films. There were several reasons for this. One was that British films definitely improved in terms of scripts and, because the number of films in production fell, a greater concentration of available resources. A number of wartime films were particularly successful in both representing the realities of war and in sensitively meeting audience expectations, which in any case were more likely to be for British stories at this time. The increased attention to the mixing of social classes in documentary dramas was one example of a change in film narratives matching a change in social lives. Immediately after the war, there was a brief period when Hollywood films were in short supply as a result of restrictions on imports. When the war ended, popular audiences flocked to Gainsborough melodramas and followed stars like Margaret Lockwood and James Mason. Gainsborough was one of the small studios under Rank’s umbrella, but another aspect of Rank’s distribution strategy was the so-called ‘quality’ or ‘prestige’ productions financed by Rank but made by independent producers such as The Archers, Cineguild (David Lean and Ronald Neame) and Individual Pictures (Frank Launder and Sydney Gilliat) etc. These were aimed partly at opening up the American market for British films. They were relatively expensive and narratively ambitious films. Some of them were seen as too highbrow for popular taste and eventually they split the critics. The majority of British film reviewers and critics at this time favoured films that were ‘realist’ in aesthetics and humanist and ‘socially-concerned’ in theme. This meant that certain ‘quality films’ were highly praised, in particular those made by David Lean and Carol Reed (e.g. Lean’s Brief Encounter and Reed’s Odd Man Out). The Archers films fitted none of these criteria and A Matter of Life and Death and I Know Where I’m Going were both criticised for ‘whimsy’ and triviality and for being ‘tricksy’ (even when their undoubted technical proficiency was praised). “ . . . an ambitious attempt on a great filmic subject – the tragedy of Diaghilev and Nijinsky – that filters into trivial Technicolored magnificence.
. . . into the flurries, flounces, turmoils and sweat of that esoteric life behind the curtains of the ballet . . . Powell and Pressburger touch better cinematography and better realism than in any of their other films. This ballet is certain to be acclaimed as a cinematic masterpiece on the ground that it departs entirely from realism. But its escape is into the realms of Disney and the Hollywood dream sequence. Far from gaining from such licence it becomes blurred by Technicolor, overpowered by decor and confused by its own fantasy. The ‘Red Shoes’ ballet is an essay in complicated camera trickery for its own sake, assisted by some no more than adequate music and dancing. In retrospect, Winnington’s review says more about the obsessions of the reviewers of the time than about The Red Shoes. The important points to note are the praise for the ‘realism’ of the backstage scenes and the attack on the display of excess. The reviewer, who has seen many Powell and Pressburger films before, seems unwilling to accept the film for what it is and instead wants it to be something else. The closing comment about the lack of taste in showing Vicky’s injuries is also a familiar charge laid against The Archers. How, we might ask, does a reviewer seeking ‘realism’, especially in the violent world of the 1940s, manage to equate it with good taste? There were critics who disagreed with Winnington about the ballet sequences. Affron and Affron (1995) quote C.A. Lejeune of the Observer and Dilys Powell of Golden Screen, both of whom heaped praise on Hein Heckroth. (Between 1946 and 1949, the independent producers working at Rank studios dominated the Hollywood Oscar awards for design). Many commentators have tried to make parallels between the ‘excesses’ of the 1890s in British cultural life and the ‘sensations’ of the 1990s, so perhaps Taylor is right. What is certainly true is that The Red Shoes has survived as a cinematic tour de force when many of the films praised by critics in the late 1940s lie neglected in the archives. In response to the AS Film Studies question, The Red Shoes clearly did not reflect the views of the contemporary (British) critics, but it certainly did appeal to audiences worldwide. The AS Film Studies specifications for the ‘Close Study’ require evidence to be selected from a particular sequence. This is quite difficult in the case of The Red Shoes, since the readings suggested above refer to the film as a whole. One possibility may be to take the sequence starting with Vicky’s invitation to Lermontov’s villa in Monte Carlo (the sequence analysed above with the Jacques Fath dress) and carrying on through to the rehearsals for ‘The Red Shoes’ ballet and Sergei’s acceptance of the bet by Lermontov that the audience will clap half way through Vicky’s performance. This ten minute sequence is pivotal for the narrative. It demonstrates Lermontov’s decision to make Vicky a star – to invite her to become the expression of the troupe’s desire. It also acts like many of Hitchcock’s best narrative sequences as a ‘marker’ for what will come later. Vicky and Julian meet on the balcony as the train rushes through below – just as it does when Vicky hurls herself from the same balcony at the end of the film. And as Vicky walks away, a newspaper blows against her leg, as it will do in the ballet, but this paper neatly shows Vicky and Julian pictured alongside each other, heading an interview with Lermontov. The image then cuts to the choice of the red shoes to be used in the ballet. We see only the walking sticks of two men. One stick selects a shoe and hammers the ground to emphasise its choice. The other hesitates, but follows. We assume the first stick is Lermontov’s and the second Grischa’s (he plays the role of the shoemaker in the ballet). As well as the decisiveness of Lermontov, this helps to emphasise the close parallel between Lermontov and Vicky and the shoemaker and the girl in the story. Little has been said in these notes about the ballet itself and how it has been constructed as an unbroken sequence. The AS questions concentrate more upon ‘messages and values’ than on technique. Suffice to say here that the innovations of The Archers team were closely monitored within the industry and that Hollywood built upon them in dance sequences that appeared in musicals during the next few years, particularly in the two Vincente Minnelli films An American in Paris (1951) and The Band Wagon (1953) (in which Cyd Charisse plays a ballet dancer who dons red shoes to dance as a femme fatale with Fred Astaire). The fast cranking and variable camera speeds adopted by Jack Cardiff and Chris Challis were also later copied and a detailed account of the cinematography on the film is available ‘online’ from American Cinematographer. All text in these notes © 2001 Roy Stafford/itp publications unless otherwise indicated. This entry was posted in British Cinema, Melodrama. Bookmark the permalink. Ok, I am yet to read the post. Will do so shortly. Red shoes was one of the most unique experiences of film watching for me. I never would have thought a ballet sequence could impress me so much. Thanks for the insightful article about the history of The Red Shoes and all the facets surrounding its release. I never imagined critics to be ambivalent about this one! I always had a suspicion that The Red Shoes was a subversive interpretation of a classic fairy tale in purely cinematic terms (I still prefer Black Narcissus), this article more or less confirms that. And I also believe that the central ballet sequence acts as a kind of mirror within the film – summarizing what has happened so far and predicting the future course – also confirmed by your post. Let’s see what Burton does with Alice in Wonderland. And if there was any film worth the restoration it has to be this one. Can’t wait to see the restored version… Thanks. I ADORE this film and will always ADORE it. Thanks for the lovely writeup. There’s also a book about the moviemakers. Can’t recall the title. I think Powell might have written it. The one line will always stick in my mind is when the dance director says to the gal, “You vill dahnce The Red Shoes.” And when he is explaining where the story came from his says that it is based on a story by “Han Andersen.” This is a very important line! Note that he does not say Hans CHRISTIAN Andersen. And when this same guy is in Monte Carlo, there is a gargoyle outside his window. And so he is often framed so that it looks like he has the wings of the gargoyle. And the set dressers were going to sweep up and clean up the weeds that were on those l000ng steps that the ballerina walks up to see the the guy. The producers said to leave it look ruinous. 0000h! How lovely! A new ebook has been published titled Jacques Fath Designs The Red Shoes on the making of the film, available at Amazon, barnesandnoble.com and iTunes. Also available in French as Les Chaussons rouges et les costumes de Jacques Fath.